Town of Maggie Valley Powell Bill Street Inventory Corporate Limits. Town Maintained Streets These streets not only meet the Town’s stringent Construction & Design Guidelines but also have been accepted into the Town’s Publicly Maintained Street System by the Board of Aldermen. Currently, the Town maintains thirty-three (33) unique streets totaling 6.67 miles. View the list here. Private Streets The majority of roads within Maggie Valley are owned and maintained by private citizens. These private streets are under private ownership. The responsibility of upkeep lies with the owners. North Carolina Department of Transportation Maintained State Roads NCDOT is responsible for maintaining the following State Roads within the Town of Maggie Valley, its extra-territorial jurisdiction (ETJ), and the greater community. These roads are easily identified by the “SR” and number located on the street sign and stop sign. Purpose: The goal and intent of this policy is to establish both a procedure and funding threshold to be used by the Board of Aldermen when allocating Non Powell Bill Street Maintenance Funds. 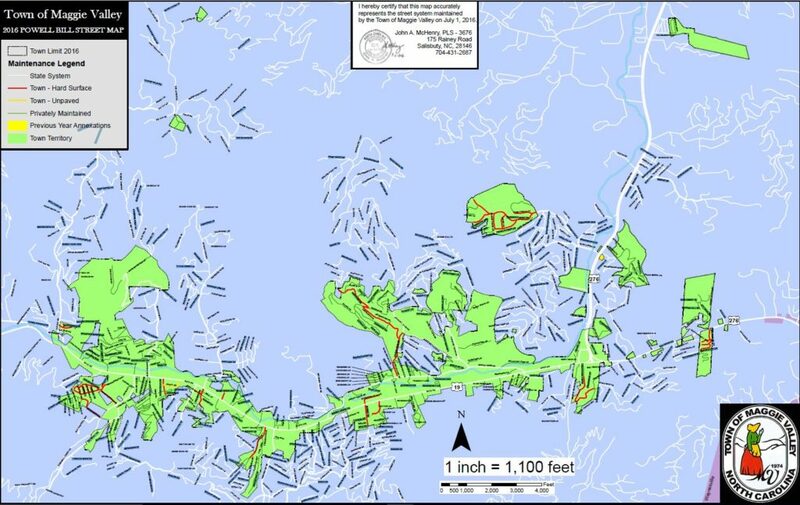 History: The Town of Maggie Valley maintains approximately 6.67 miles of residential streets. These streets are built to the highest possible construction/design standards and meet the North Carolina Department of Transportation Powell Bill Street Standards. 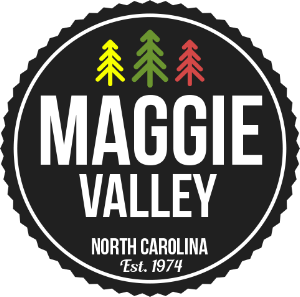 The Town of Maggie Valley has experienced tremendous growth since it was incorporated in 1974 both in terms of population and land mass area. As the corporate limits of the Town expanded, they expanded into areas with existing roads that did not meet the Town Street Standards making them ineligible for Town Street Maintenance. The maintenance and responsibility of these private streets fell to home/property owner associations. Over the past decade maintenance of these private street systems has financially overwhelmed homeowner/property associations throughout town. These groups have petitioned the Town for financial assistance in varying street improvement projects. The Town has financially contributed to a number of street improvement projects on a case by case basis as budgetary funding allowed. As more and more private streets need assistance, the Town’s need for a formalized private street allocation policy has become necessary. Beginning on January 1, 2012 applicants seeking financial aid with their private street system must meet with a Town Street Official before completing the required assistance application packet available on the Town’s website or at Town Hall. Information required by the application packet will include but not be limited to, street name, street location, street grade, number of existing homes, number of vacant lots specific amount requested and certified cost estimates from at least two contractors. Paving contractors must be on NCDOT prequalified bidder list. 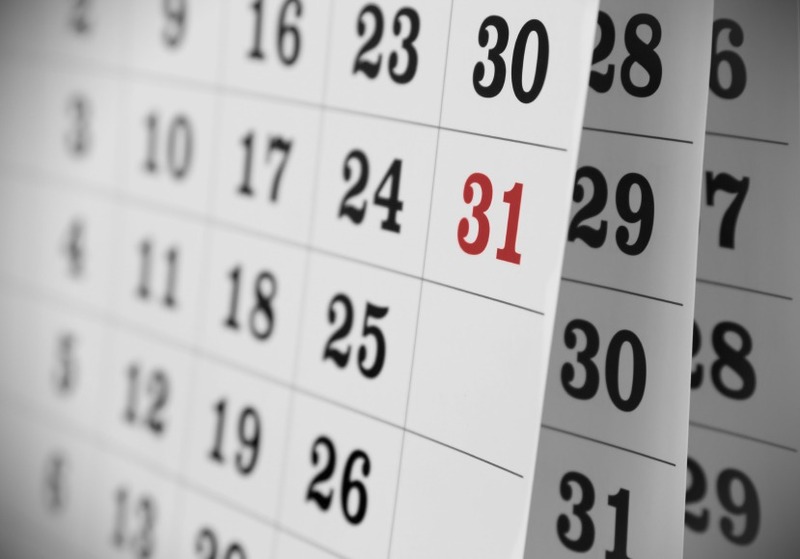 To be considered for funding, applicants must submit a completed application packet no later than May 1. Technical review of the applications will be completed before the proposed fiscal budget for the upcoming year is released. Notification of funding will coincide with the approval of the fiscal year budget. If you live on a private street and that needs maintenance, there are opportunities to join in a partnership with the Town to make repairs. Does project meet Town of Maggie Valley Construction & Design Standards? The vast majority of streets in Maggie Valley are considered privately maintained. Typically, streets within this category are not eligible to be part of the Town’s Street Maintenance because they do not meet the Town’s Construction & Design Standards or they have not applied to be included within our system. However, the Town does provide some limited maintenance services to private streets, including pot hole repair. Additionally, the Town’s Non-Powell Bill Street Maintenance Fund Policy provides a vessel for neighborhood associations to seek the Town’s financial assistance when seeking to improve or upgrade existing private streets. If your neighborhood is interested in applying for these funds please complete the Non-Powell Bill Street Maintenance Fund Application. Public Works maintains twelve (12) miles of public sidewalks throughout Town. 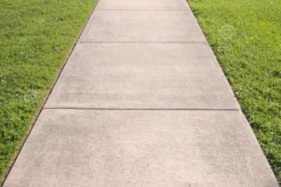 Sidewalks provide opportunities for pleasure walking and exercise. Studies have shown that people with access to sidewalks are more likely to walk outside, which helps citizens meet their recommended physical activity target. 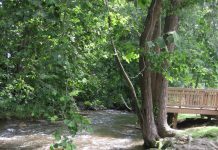 They also provide a valuable transportation link connecting pedestrians with all Maggie Valley has to offer, without relying on a car. The Town provides a high quality sidewalk for pedestrian users. Occasionally damage occurs to the sidewalk system that we may not know immediately. Please report any damaged sidewalk conditions to Town Hall at (828) 926-0866, use the form below or email your information to scoker@maggievalleync.gov. Please provide the exact location and a brief description of the damaged sidewalk. 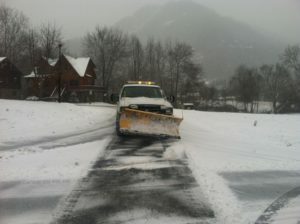 Purpose: The goal and intent of the Town of Maggie Valley Public Works Department is to maintain a safe road network by providing an efficient and effective snow and ice removal program. The weather in Western North Carolina is unpredictable, and the unique nature of each storm event may dictate variations to this policy. 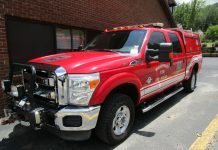 The purpose of this information is to outline the general snow removal procedures of the Town in addition to providing suggestions to how you, as a resident of Town of Maggie Valley, can help the Public Works Department in this effort. It is our hope that the Town’s efforts, along with the cooperation and assistance of an informed public, will result in a safe winter season with minimal disruptions to ongoing daily activities. The Town has sole and total discretion to plow private streets, with no duties, obligations or responsibilities. The Town may provide snow and ice removal services to additional streets not listed on the chart above with written property owner consent. If you live on a State Road that is not listed above, please contact NCDOT at 828/456-0336 for more detailed information about their snow and ice removal policy on your road. Snow Plowing & Deicing Procedures: Upcoming storm events are monitored and tracked using available data from the news media and internet resources. 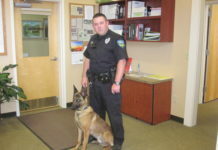 The Police Department also keeps the Public Works Department informed of road conditions and notifies the Public Works Director when action is needed. Snow removal from streets will begin when there is a minimum of one inch of surface snow with the probability of continued accumulation. Spreading of chat and/and or salt will commence immediately upon evidence of snow or ice on road surfaces that does not show evidence of imminent melting. Material Handling & Application: The Town uses both abrasives (chat) and salt. The best use of these materials is subject to many variables such as traffic, temperature, sunshine, stored heat in the pavement and adequate forecasting of weather conditions and changes. How satisfactorily and economically results are achieved depends on the staff’s skill on tailoring operations and concerns to these varied conditions. Chat is cheap to buy, offers immediate traction on slippery surfaces and offers visible evidence of action by Town crews (an important psychological advantage to the driver and to the town’s public relations program). Significant disadvantages are low miles of coverage per truck load (thus requiring much reloading and dead hauling of empty trucks), dirty, hard on car windshields and finishes and generation of an appreciable cleanup job following the storm’s end. The use of salt can damage nearby salt sensitive vegetation and infiltrate ground water. When applied as dry rock salt, it stays in place on loose slush but segregates, bounces off and slides wide on ice. Salt is dormant when applied and slow to embed at temperatures of 20 F or less. Therefore traffic may cause considerable loss. The use of abrasives and salt as a snow and ice control procedure is to be minimized to conserve the environment and control costs. Road Rights of Way: Please make every effort not to park vehicles on the road or along the road right of way when snow or ice is anticipated. Parked cars make the snow removal efforts very difficult and in some instances may prevent your street from being scraped. Trash Pickup: If you are on curbside trash pickup, please do not place your trash receptacle out on the road over night if a snow storm is anticipated. 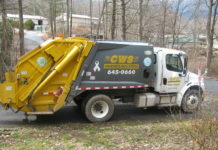 The Town’s subcontracted trash hauler will make every effort to pick up your trash in the event of a storm. However, if road conditions are dangerous or the snow/ice makes it impossible for the trucks to do their routes, Consolidated Waste Services may decide to pull their trucks off the roads. In that event, your trash will be picked up as soon a majority of Town Streets are deemed passable. You can check the status of trash pickup by calling the Town Hall at 828/926-0866 or check the Town’s various digital platforms. Driveway Clearing: Homeowners are responsible for clearing their own driveways. To avoid extra shoveling, wait until the road has been plowed to the curb before removing the snow at the entrance of your driveway. When removing snow from your driveway, place the snow on the right side of the driveway (facing the road). This will prevent the added snow from being plowed back into your driveway during the Town’s plowing operation. Please do not blow, plow or shovel snow into the roadway when clearing your driveway. Fire Hydrant Clearing: Any effort to aid the Fire Department with keeping a hydrant in front of your house cleared of snow is appreciated. Clearing around the hydrant with a path to the road helps protect the safety of you and your neighbors. If you would like to apply for snow and ice removal please come by Town Hall. The Town of Maggie Valley receives numerous requests regarding the monthly operation of streetlights. The primary purpose of streetlights is to provide drivers with quick, accurate, and comfortable visibility at night. A major cause of accidents at night is poor visibility. Street lights aid in reducing these accidents and facilitating the traffic flow. Citizens should realize that streetlights are provided for traffic safety, not property security. 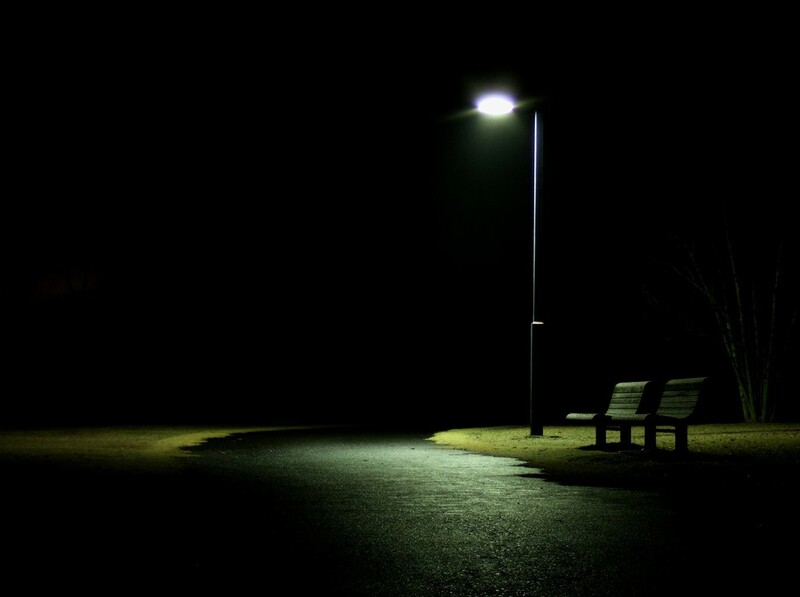 It is true that streetlights do provide some amount of security in residential areas. This, however, is not their primary intent and their monthly operation shall not be considered for security reasons alone. The following is provided to explain the Town’s policy and procedure on monthly street light operations. The requested location is at the intersection of two (2) or more streets. The requested locations is at the terminus (cul-de-sac) of a street in excess of 450 feet in total length. The requested location is located at a horizontal or vertical curve of a street, which in the opinion of the Chief of Police, may be hazardous to vehicular or pedestrian traffic. Existing streetlights that receive streetlight operations funds that that do not meet this criteria will have their operation funding eliminated. To be considered for monthly streetlight operations it shall be the responsibility of the property/home owners association to complete the Streetlight Operations Request Form. If no POA/HOA exists then it shall be the responsibility of each affected property owner. In a brief paragraph, please describe where and why a street light is needed. 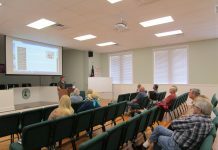 The Public Works Director takes requests to analyze traffic counts and speed reports in neighborhoods, works with the Town of Maggie Valley Police Department to manage traffic flow and parking in neighborhoods, and analyzes and plans for traffic flow throughout town.